Get UFC tickets at SeatGeek! Commentary and fight card discussion courtesy of David St. Martin. David is an editor and MMA contributor for SB Nation. You can follow him on Twitter @SaintMMA. With UFC 128 ticket prices averaging around the $270 mark you would never guess that UFC 128 features a championship bout between two fighters largely unknown to casual fans. While a legend in the MMA world after becoming PRIDE’s light heavyweight champion at only 23 years of age, Mauricio ‘Shogun’ Rua doesn’t have the name recognition of other stars like Couture, Liddell and Lesnar. Rua’s mystique from his time fighting in Japan has largely been tarnished due to a rash of unfortunate injures. Just as Rua seemed to finally have pushed past his issues, it was revealed back in May that he would undergo knee surgery for a third time. It’s because of this that Rua has had trouble gaining momentum. His infrequent appearance inside the octagon has made it hard to gain traction with fans. Since joining the UFC’s ranks in 2007, Rua has only fought five times. To put that in perspective, Rua’s opponent — 23-year-old Jon Jones — will have fought nine times since signing with the promotion less than three years ago. These relatively high ticket prices may be a testament to the selling power of the intriguing young contender. While technically not undefeated, Jones has never been beaten. A north-to-south elbow strike from the anxious youngster was ruled illegal, disqualifying him and resulting in his sole loss. His dismantling of previously undefeated Ryan Bader just over a month ago propelled him into a position he may not be ready for, but one in which fans are hoping he thrives in. Jones is exactly the kind of fighter who could add some order to a very slippery light heavyweight division. His youthful exuberance, paired with his evolutionary fighting style are going to make him one of Dana White’s biggest draws If he can capture the championship on Saturday night. The fight itself is a nightmare on paper for the champ. Rua has had trouble defending takedowns since his arrival to the UFC. Coming off another knee surgery, I think it’s safe to say that trend will continue. From there, Jones’ ground and pound is literally bone crushing. Because Shogun has but one submission victory to speak of, the prospect of him fighting off his back while fending off Jones is fairly discouraging. The Brazilian’s guard won’t intimidate the young contender. If Jones can close the distance, corner Rua and get him to the mat he should take this fight. With everything to consider, it’s not hard to see why oddsmakers have made Jones a 2-1 favorite over the seasoned champion. In addition to the main event, the remainder of UFC 128’s card is packed with notable names. Former WEC champion Urijah Faber returns to the bantamweight division to take on Eddie Wineland, a fighter coming off back-to-back ‘knockout of the night’ performances. The Legendary Mirko Cro Cop will face one of the top heavyweight prospects in the very dangerous Brendan Schaub. Although Japanese superstar Yoshihiro Akiyama was forced withdraw from his bout with Nate Marquardt due to the tragic events in his homeland, the UFC has found a solid replacement in Dan Miller. Dan will now join brother Jim on the night’s main card as the New Jersey locals entertain friends and family. 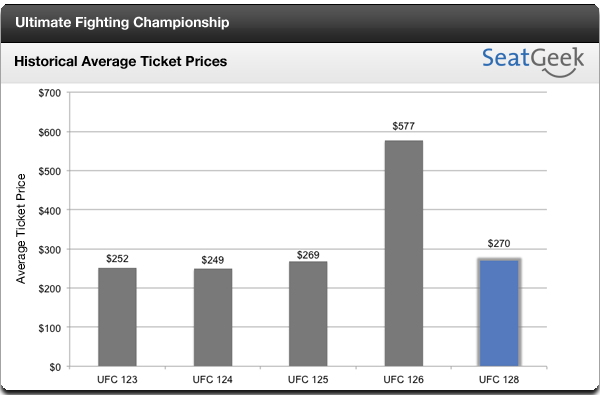 At an average of $270, UFC 128 ticket demand is certainly not weak and is truly a testament to the excitement around burgeoning MMA superstar Jon Jones, but you can see that this demand doesn’t come close to that spurred by MMA legend Anderson Silva at UFC 126. Do you think this card can top the excitement of Silva’s front kick knockout? Will Jon Jones become an instant star by securing the Light Heavyweight Championship? Share your thoughts in the comments, or connect with us on Twitter.